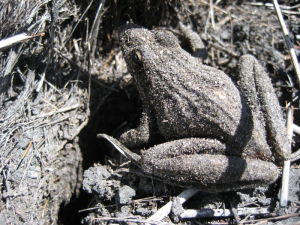 While we were making holes for an experiment in some recently burned fynbos this frog appeared. It must have been buried in the soil. See how well camouflaged it is. Incidentally, this is a colour photo, despite looking like its in black & white. Ashes from the fire make the soil a grey colour.